Classic paella is best when made in a traditional paella pan. Made from thin carbon steel, the bases are hammered to produce small dents that help expand the base to prevent buckling when heated. They also aid in more uniform cooking and in the development of the delicious toasted rice bottom known as socarrat. The shallow, splayed sides encourage the evaporation of liquid and speed up the cooking process. Carbon steel paella pans are commonly used but require some care. They must be washed, seasoned and stored in a dry place to keep the carbon steel from rusting. Over time, ingredients will react with the steel and develop a patina that will impart a unique flavor to the dish. Although paella is usually best when cooked over an open flame, this style is induction-compatible. Not dishwasher-safe. 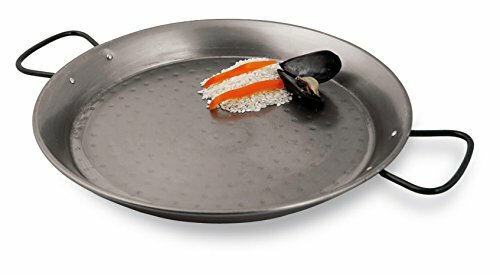 Classic-style paella pan made from carbon steel. Season before using; not dishwasher-safe. Diameter with handles is 23 1/4in.